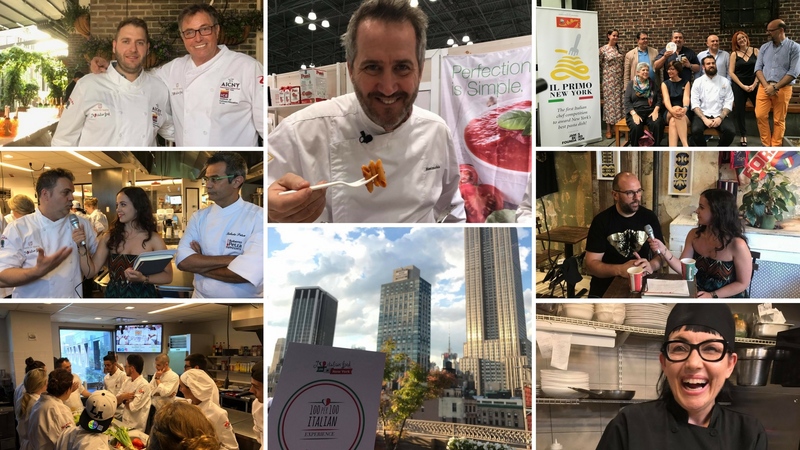 I Love Italian Food Live in New York has dedicated 4 great days to Italian food, passionate Italian chefs and great Italian projects that, like us, has the objective of promoting the real made in Italy worldwide. Our first appointment has been during the awards ceremony of the new best Primo di New York, the very first Italian competition that awards New York’s best pasta dish. The second edition of the contest created by Giuseppe di Martino was held in the prestigious James Beard Foundation, where chef Joshua Pinsky, the young executive chef at Momofuku Nishi, received the first prize with his “ceci e pepe”, a cacio & pepe with no cheese but chickpeas, while Massimo Sola, first edition winner, was preparing the gala dinner for the guests, of course paying homage to pasta. Saturday June 24th, we have been welcomed by chef Michele Mazza, president of Association Italian Chef of New York, and chef Raffaele Solinas, at the Institute of Culinary Education to discover how the AICNY is pursuing its mission of educating about Italian food and more. We have also met the guys from the Taste to Taste: giovani chef per il made in Italy, together with their mentor Roberto Petza, the only Michelin starred chef in the whole Sardinia, who explained us the educational activities within the project. Being Italians means also craving for a real espresso, so we had to take a proper coffee break and the right place was Piccolo Cafe, where even the walls speak Italian. Indeed, all the projects of its founder, Michele Casadei Massari, are about Italian culture: from music and art to sport and literature. And for dinner? We have met Rosanna Di Michele, executive chef of the new born restaurant Donna Margherita, which offers its New York guests the genuine dishes of Italian cuisine, those recipes that Rosanna knows since she was a kid and she used to cook in her hometown. Now also Upper East Side Newyorkers can taste the real Italian flavors. The happily ended with our 100per100italian experience, on the beautiful Midtown Terrace in the heart of Manhattan: a night organized in collaboration with the AICNY to celebrate all together the real Made in Italy food. We completed our I Love Italian Food Live in New York directory from the Summer Fancy Food Show, with two great storytellings about Italian food: chef Massimo Sola revealed us what’s behind one of the most traditional dish of our cuisine, pasta al pomodoro, while together with chef Michele Mazza we have discovered the secrets of the Balsamic Vinegar of Modena PGI. Thanks to: Le 5 Stagioni, Balsamic Vinegar of Modena PGI, the Original, Contadi Castaldi Franciacorta, DHL, Moretti Forni, Parmissimo, Pomì, Smeg, and AICNY Associazione Italiana Chef New York.